Hosiah Chipanga is a Zimbabwean musician. He is known for his comic and satirical lyrics that focus on social commentary. He specialises in the Sungura genre. Apart from music, Chipanga has formed a church which he later turned into a political party. Chipanga is known for being outspoken and in August 2015 he caught social media attention with a Heroes Day rant on Facebook. 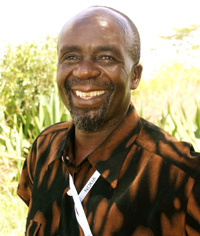 Hosiah Chipanga was born on 21 February 1952. Since 1982, Chipanga has been fronting the band Broadway Sounds which he changed to Vaparidzi Veshoko in 2007. Over the years Chipanga has belted out hit singles that include; Kwachu Kwachu, Gushungo among many others. In October 2011, Chipanga launched his church Messiah Apostolic Prophetically Inspired People's Institution (MAPIPI). Chipanga claims that he received his divine calling in Sheba, Penhalonga on September 13, 1977. He was detained by the police in 1979 when told them about the idea. In June 2013, Chipanga was reportedly turning his church MAPIPI into a political party so that he would contest in the harmonised elections that were held in the same year. Chipanga had in 2008, confessed that he harboured presidential ambitions although he had failed to contest in the 2008 harmonised elections. Hosiah is believed to have chickened out at the last moment concerning running as a presidential candidate in 2013. "I want to thank all our freedom fighters, the chimbwidos and mujibaz (war collaborators), dead and the living, for the great job they did to liberate us. Thank you all. Moreso, I would like to thank our colonisers for making Rhodesia a country worth fighting and dying for. Had it been as what Zimbabwe is today, no one would have thought of fighting for it. If the dead would rise today they would sure demand back their lives and return Zimbabwe to Rhodesia, for they never died to make the country poorer, never for their children to be beggars in other countries. Who in his or her normal sense would have fought and died for a country in this present status? I wish the dead would rise and see for themselves what their blood has brought to their families here present." Please visit the following to contribute to the profile of Hosiah Chipanga.